How does the Air New Zealand Skycouch work? Should you choose it over Premium Economy? Discover everything you need to know about this popular offering, and find out why you should consider the Skycouch for your next long haul family flight. The Air NZ Skycouch was first launched in 2010. Back then, it was dubbed “Cuddle Class” by the press, and it was lauded as a very innovative product. The product was originally intended for two adults to lie side by side in economy. However, Air New Zealand Skycouch bookings soon became popular with another group of travellers – families flying with children – and it remains a product of choice for travelling families to this day. The Air New Zealand Skycouch is a simple premise. Essentially, it’s a row of 3 consecutive seats, blocked off exclusively for the use of one party. The seats convert into a couch or small bed by having the armrests flip up out of the way and the footrests lifting up to create a level space. This configuration can only be offered after take-off and before landing as passengers must be seated upright in their own seat for ascent and descent. The Air New Zealand Skycouch isn’t bookable as a separate cabin class. Rather, passengers travelling in economy can choose it as an ‘add on’ during the booking process (more on this below). Where are Skycouch rows located? 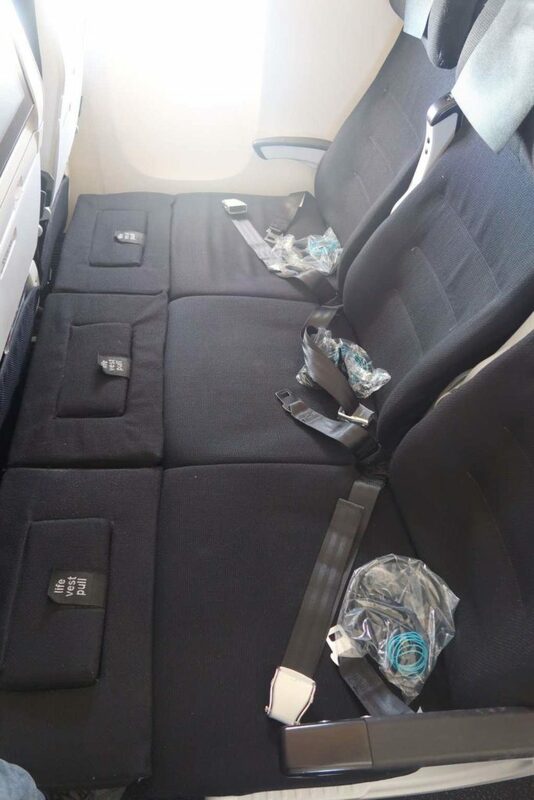 The Air New Zealand Skycouch is located in economy class, but not all rows in the cabin offer it. 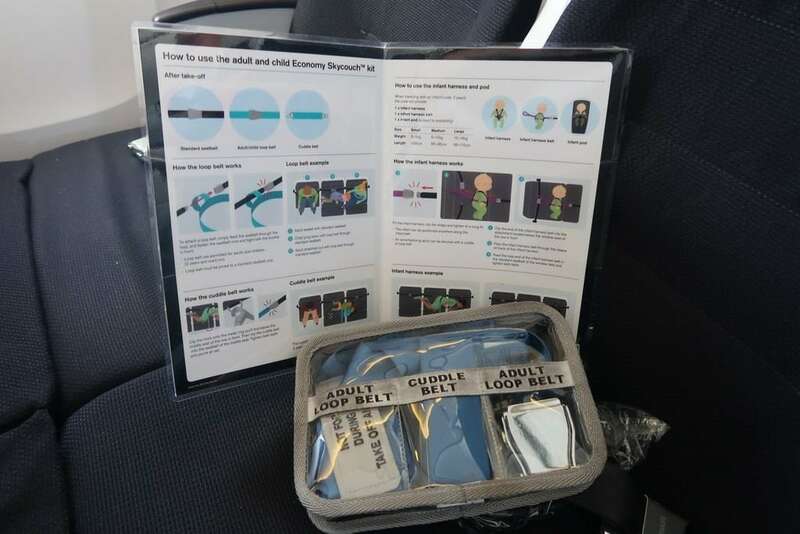 As an example, on the Air New Zealand Boeing 787, economy class commences at row 35, with the couches available in rows 37 to 44 in seats ABC and in rows 36 to 40 in seats HJK. This leaves room for higher status economy passengers to be seated just forward of the couches across several rows. How does the Air NZ Skycouch work? The rows that convert to Skycouch are different seats to the standard economy seating. 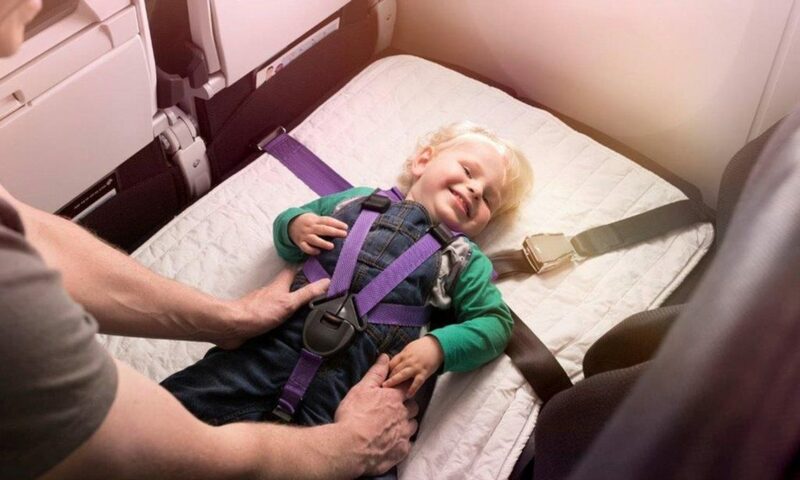 It is the additional belts and harnesses that make Skycouch work so effectively for those travelling with children. Above, the Skycouch configuration, prior to cabin crew supplying the bedding and pillows that make it so comfortable. How big is the Air New Zealand Skycouch? The Skycouch boasts a length of 5’1″ (1.55m) across the 3 seats. The width from seat back to seatback is 29″ (74cm). While innovative, the product is still somewhat cramped in reality, so calling it “Cuddle class” for two average adults is optimistic. Generally speaking, a journey in Skycouch costs around the price of 2.5 economy seats. However there appears to be some significant variation driven by the number and age of passengers. Ultimately it’s a supply and demand exercise. At best you should expect to pay less than a full third seat fare. 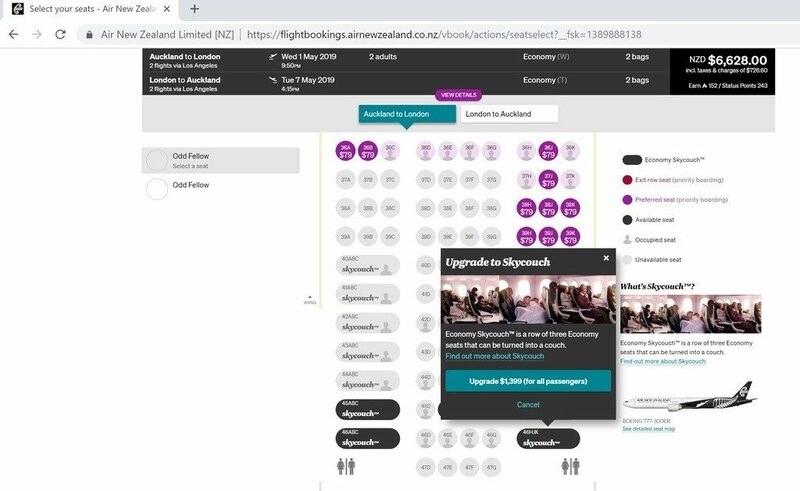 We’ve crunched the numbers below on the cost of airfares across Economy, Economy with Skycouch add on and Premium Economy, using a scenario of Auckland to London, return, flying 1st and 7th May 2019. 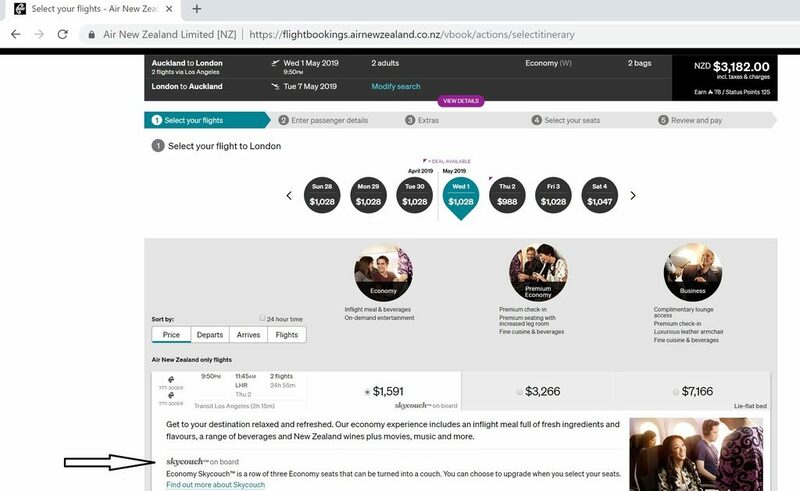 *Standard airfare pricing has been sourced from the Air New Zealand website at the time of writing. Crunching the numbers, if you’re an adult travelling with children, the cost to upgrade from base level economy to the Skycouch lie-flat configuration ranges between $379 and $1,326. Many travellers will find this a reasonable price to pay to get enjoy their own “space”. If you’re considering a journey on the Skycouch, you may also be looking at Air New Zealand premium economy as an option. So, which should you choose? In a nutshell, Skycouch gets you to your destination in a ‘no-frills’ lie-flat configuration whereas Premium Economy provides a higher-end meal and entertainment offering with the restriction of a recline seat. Essentially, the Skycouch is more about comfort and less about service. To get anywhere near as relaxed, a huge cost jump would be required into Air New Zealand Business class. If you’re flying alone and don’t expect to sleep, Premium Economy is a better option for a full service meal, but if you value sleep, you may prefer to opt for Skycouch. If you’re travelling with young children, Skycouch wins hands-down. Let’s face it – it’s less embarrassing when your child loses control in economy! 2018 saw Air New Zealand introduce a range of innovations for the Skycouch. This includes new harnesses and collapsible infant pods (called a Skycouch Infant Pod). The Skycouch Infant Pod provides better comfort and protection leading to more infant sleep. And, children no longer need to be woken and placed on an adults lap during turbulence (a big plus in our book!). Are there any drawbacks to the Air New Zealand Skycouch? Yes. If you usually like to travel in style, remember that the product is located in the economy cabin. You’ll share the same toilets, eat the same food and receive the same service as the rest of economy. There is far less privacy than a Business class seat. Having said that, parents of young children may prefer this option for long haul flights. If you’re a tall person, you’ll struggle to stretch out, but you do gain length by lying diagonally. The cost is also high, relative to some competitive premium cabin fares, especially when on sale, so this needs to be taken into consideration. Which Air New Zealand flights offer Skycouch? 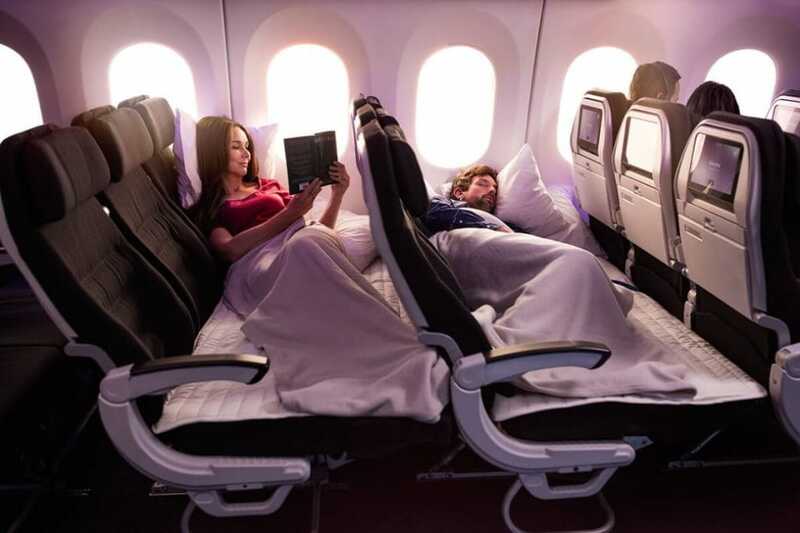 The Skycouch is only available on the long-haul fleet of Air New Zealand. This includes the Boeing 787 Dreamliners and Boeing 777s which service international destinations. There are limited opportunities to sample the product on trans-Tasman routes ex Australia, as it’s wholly dependent on the plane servicing the route. Additionally the routes will only lead back to New Zealand. However, if you’re keen to take a detour to New Zealand prior to heading to Europe or the USA, then the Skycouch is definitely an option. The Air New Zealand Airbus A320 (International) planes that serve the Pacific Islands and Australia do not feature Skycouches. How do I book the Air New Zealand Skycouch? 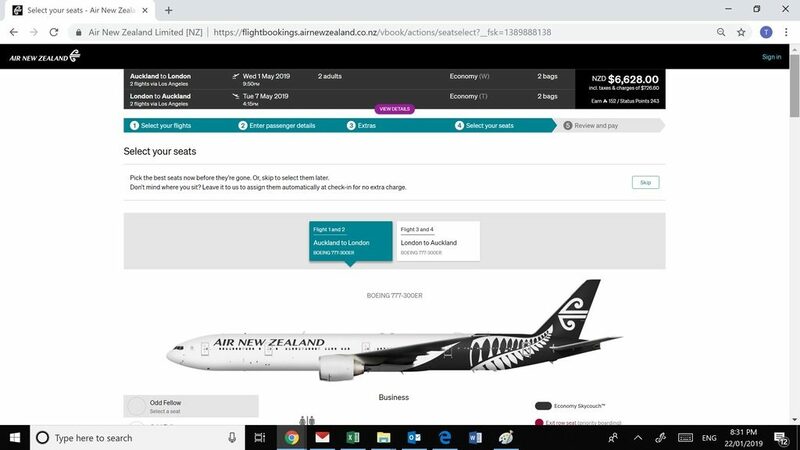 The option to purchase an Air New Zealand Skycouch for your journey will appear as part of the booking process. It’s similar to purchasing a seat in an exit row. Note that grey seats are unavailable. In this case we’ve selected a Skycouch right in front of the lavatories – never a good idea! Despite an early misfire in Air New Zealand’s marketing as an adult-centric product, it has now firmly established itself as a family friendly offering. With the implementation of child-friendly equipment upgrades in 2018, the Air New Zealand Skycouch remains an innovative and world class offering that is unique to the airline. 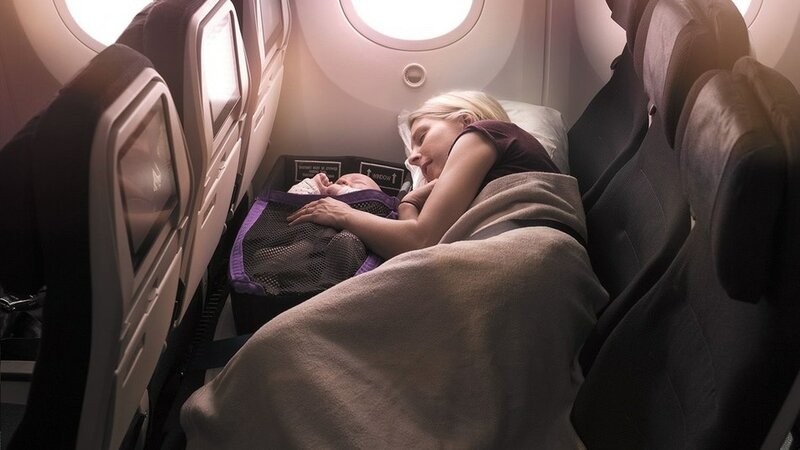 And while a journey on the Air New Zealand Skycouch still puts you in economy, in many scenarios it could still be a superior experience to flying in a premium cabin, especially when travelling with young children.